So the other day I was driving around Bloemfontein, the city where I live and study, when I was inspired by a street name to write this post. A few street names in Bloemfontein bear witness to the Reformed heritage of the South African Afrikaner people (which unfortunately is widely neglected today), including Calvynsingel (Calvin Crescent), John Knox Street, Luther Street, and Coligny Road. It was the latter that drew my attention and inspired me to post this one. The French Wars of Religion (1562-1598) were largely the result of increasing religious (Catholic vs Huguenot) and political (different aristocratic houses) tensions. The spread of Reformed Protestantism in France didn’t go down well with the Catholics. It is generally agreed that the wars started with the Massacre of Vassy in 1562, the first of many massacres of Protestants, where a reported 63 Huguenots were killed and over a hundred more wounded when the barn in which they were holding a church service was set on fire. Despite further persecution of the Huguenots in the subsequent years, their number continued to grow throughout France (does Tertullian’s famous phrase “the blood of the martyrs is the seed of the church” come to mind?). In 1570 the Peace of Saint-Germain brought a brief end to the conflicts, at least on paper. France was still rife with religious and political tension. The very influential Guise family, staunch Catholics, could not stomach the readmission of Huguenot leader Coligny to the King’s council in September 1571. Many Catholics thought Coligny had tried to persuade the French king to side with the Dutch (Protestants) against the Spanish (Catholics) during the Dutch Revolt, which didn’t help to soothe religious and political discord. The queen mother, Catherine de Medici, and her son, King Charles IX, attempted to cement the peace between the religious parties by having Catherine’s daughter, Margaret of Valois, marry the Protestant prince Henry III of Navarre on 18 August 1572, which, to put it lightly, did not go down well with the Catholics. The wedding led to the gathering of Huguenot nobility from far and wide in predominantly Catholic and anti-Huguenot Paris. After the wedding, Coligny and the Huguenot nobility remained in Paris in order to discuss some outstanding grievances about the Peace of Saint-Germain with the king. The queen mother was concerned that Coligny may succeed in persuading the king to side with the Dutch in their conflicts with Spain, and accordingly gave her approval to a plot devised by the above-mentioned staunchly Catholic house of Guise to assassinate Coligny. On 22 August 1572, there was an unsuccessful assassination attempt on Coligny, in which he was severely wounded. The king promised to investigate the attempted assassination in order to appease the angry Huguenots, but his mother, Catherine, convinced him that the Huguenots were on the brink of rebellion and persuaded him to authorize the Guise family’s plot and allow the Catholic authorities to butcher the Huguenot leaders. 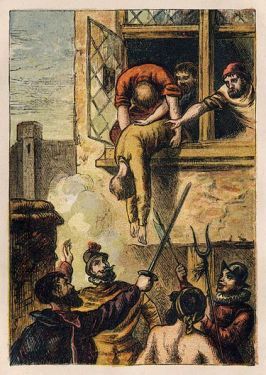 Thus the St. Bartholomew’s Day Massacre broke out on the night of 23 August and the morning of 24 August 1572, where thousands of Huguenots were killed. 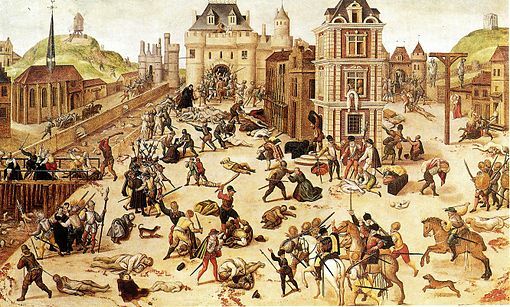 The Catholic Parisians, overcome by bloodlust, ended up not only slaughtering the Huguenot nobility but also Huguenots in general, sparking similar mass killings of Huguenots elsewhere in France. So it was determined to exterminate all the Protestants and the plan was approved by the queen. They discussed for some time whether they should make an exception of the king of Navarre and the prince of Condé. All agreed that the king of Navarre should be spared by reason of the royal dignity and the new alliance. The duke of Guise, who was put in full command of the enterprise, summoned by night several captains of the Catholic Swiss mercenaries from the five little cantons, and some commanders of French companies, and told them that it was the will of the king that, according to God’s will, they should take vengeance on the band of rebels while they had the beasts in the toils. Victory was easy and the booty great and to be obtained without danger. The signal to commence the massacre should be given by the bell of the palace, and the marks by which they should recognize each other in the darkness were a bit of white linen tied around the left arm and a white cross on the hat. Meanwhile Coligny awoke and recognized from the noise that a riot was taking place. 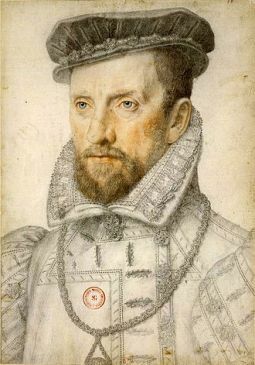 Nevertheless he remained assured of the king’s good will, being persuaded thereof either by his credulity or by Teligny, his son-in-law: he believed the populace had been stirred up by the Guises and that quiet would be restored as soon as it was seen that soldiers of the guard, under the command of Cosseins, bad been detailed to protect him and guard his property. After Coligny had said his prayers with Merlin the minister, he said, without any appearance of alarm, to those who were present (and almost all were surgeons, for few of them were of his retinue) : “I see clearly that which they seek, and I am ready steadfastly to suffer that death which I have never feared and which for a long time past I have pictured to myself. I consider myself happy in feeling the approach of death and in being ready to die in God, by whose grace I hope for the life everlasting. I have no further need of human succor. Go then from this place, my friends, as quickly as you may, for fear lest you shall be involved in my misfortune, and that some day your wives shall curse me as the author of your loss. For me it is enough that God is here, to whose goodness I commend my soul, which is so soon to issue from my body. After these words they ascended to an upper room, whence they sought safety in flight here and there over the roofs. Meanwhile the conspirators; having burst through the door of the chamber, entered, and when Besme, sword in hand, had demanded of Coligny, who stood near the door, “Are you Coligny ?” Coligny replied, “Yes, I am he,” with fearless countenance. “But you, young man, respect these white hairs. What is it you would do? You cannot shorten by many days this life of mine.” As he spoke, Besme gave him a sword thrust through the body, and having withdrawn his sword, another thrust in the mouth, by which his face was disfigured. So Coligny fell, killed with many thrusts. Others have written that Coligny in dying pronounced as though in anger these words: “Would that I might at least die at the hands of a soldier and not of a valet.” But Attin, one of the murderers, has reported as I have written, and added that he never saw any one less afraid in so great a peril, nor die more steadfastly. Then the duke of Guise inquired of Besme from the courtyard if the thing were done, and when Besme answered him that it was, the duke replied that the Chevalier d’Angouleme was unable to believe it unless he saw it; and at the same time that he made the inquiry they threw the body through the window into the courtyard, disfigured as it was with blood. When the Chevalier d’Angouleme, who could scarcely believe his eyes, had wiped away with a cloth the blood which overran the face and finally had recognized him, some say that he spurned the body with his foot. However this may be, when he left the house with his followers he said: “Cheer up, my friends! Let us do thoroughly that which we have begun. The king commands it.” He frequently repeated these words, and as soon as they had caused the bell of the palace clock to ring, on every side arose the cry, “To arms !” and the people ran to the house of Coligny. After his body had been treated to all sorts of insults, they threw it into a neighboring stable, and finally cut off his head, which they sent to Rome. They also shamefully mutilated him, and dragged his body through the streets to the bank of the Seine, a thing which he had formerly almost prophesied, although he did not think of anything like this. This entry was posted in Church History, Huguenots and tagged Gaspard de Coligny, Jacques Auguste de Thou. I would like to know how these conspirators died. I don’t mean this in a gruesome way, but believe that justice must have met them. Thank you for this post! Thank you. I wondered about this history as Huguenots fled from France to England, Holland, other places and then to what would eventually become America where my family is. There were also Moravians who came here, as well as Dutch, Swedes, Finns and others helping to found America. In later times the Methodist evangelists would be influential in revival here too. Jesus said to his own disciples..”Be careful what spirit you are of.” when they wanted to call down fire on those who disagreed with them.